In Cispata, Colombia, the Sinú River doesn’t stay put: It is constantly changing its path, creating a vibrant estuary of saltwater-loving trees called mangroves at the northern edge of Colombia’s Caribbean coast. Mangroves live at the edge of the land and sea, providing local communities with coastal protection, habitat for their fisheries, and a wealth of biodiversity. Mangroves can also help in the global fight against climate change. In fact, these and other ocean wetlands — known as “blue carbon” ecosystems — store up to 10 times the carbon per unit area as terrestrial forests, making them a vital ally in the fight against climate change. In recent years, however, these mangroves have been under increasing pressure from expansion of agricultural lands, unsustainable tourism infrastructure, and increased logging. A new project will directly address these threats, conserving and restoring 11,000 hectares (27,000 acres) of natural mangrove forests. The project will remove an estimated 1 million tons of carbon dioxide from the atmosphere in its lifetime. 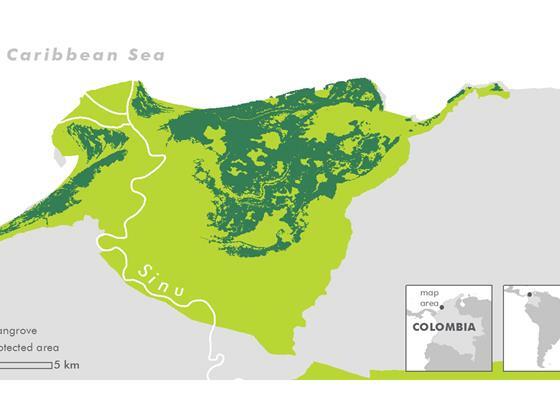 Conservation International (CI) and its partners aim to use the carbon value generated through the conservation and restoration of the Cispata mangroves to contribute to a long-term sustainable financing strategy for the region. Local mangrove map (courtesy of CI). For the 12,000 people who depend on the mangroves for food, firewood and livelihoods, the sale of carbon offsets will provide a degree of financial security as well as the initial funding needed to develop a sustainable ecotourism program and improve fishing practices in the region. Local wildlife will be protected, and a healthier mangrove forest will provide more secure employment — not to mention food security, water purification and better coastal protection against storm surges. In partnership with Apple, this initiative is helping to develop a new approach to valuing the full carbon potential of these rich marine ecosystems — from treetops down deep into the soil — and providing a model for other blue carbon initiatives in Colombia and around the world. In its first two years, the project aims to reduce emissions by at least 17,000 metric tons of carbon dioxide, equivalent to the entire emissions of the fleet of vehicles updating Apple Maps over a decade. 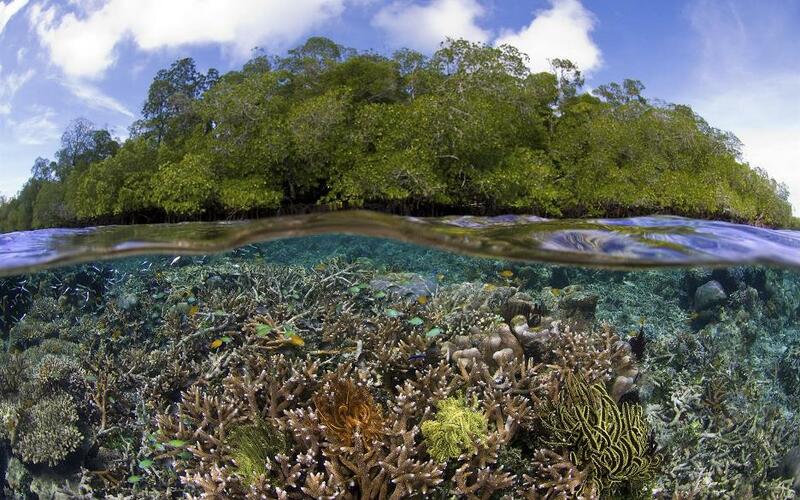 Globally, mangroves cover only 0.1% of the planet’s surface — and that number is quickly shrinking. The historical range of mangroves has been reduced by nearly half, and most of them were cleared in the past five decades. Coastal ecosystems including mangroves, seagrasses and tidal marshes remove carbon from the atmosphere and oceans, storing it in plants and sediment, and is often referred to as “blue carbon.” In fact, coastal ecosystems are some of the most carbon-rich ecosystems on Earth. When they are degraded or destroyed, their carbon is released as carbon dioxide and contributes to global climate change. When they are restored, carbon is removed from the atmosphere, and climate restoration is advanced. Featured image courtesy of CI. GUEST ARTICLE: Can 3D Ocean Farms feed the world while restoring climate & economy?